Sometimes a picture is worth more than any number of words, and while it's hard to show visually all the code changes going on we can show off a little bit of what we've been working on. For 1.0, Generations will be offering full support for the Team Arena mission pack. To run Generations Arena in Team Arena mode, it will require a legal copy of the Team Arena mission pack. However, if you do not own the Team Arena mission pack you will still be able to play Generations Arena in its normal mode. You do not need Team Arena to play Generations Arena as normal, only to play Generations Arena in Team Arena mode. That being said, here's a little taste of what's on the way. And how about some video to top it all off? Keep in mind these are test footage - and the only gameplay video I've personally recorded to date. I'm not a cinematographer. The first video is a game play test of the Heavy Chaingun and 1-Flag CTF mode for Team Arena. Note that the Tesla Mine is not yet in place in that video. You'll notice that Persistent Techs are in use in this video, as well as some classic sounds and gib effects. You'll also see some fully-animated weapons from first-person view, and to a lesser extent, third-person. The second video highlights the visuals on the Heavy Chaingun and Ion Gun. Once again, the Tesla Mine has not been introduced at this point. Now as for the weapons, here's a description of each. 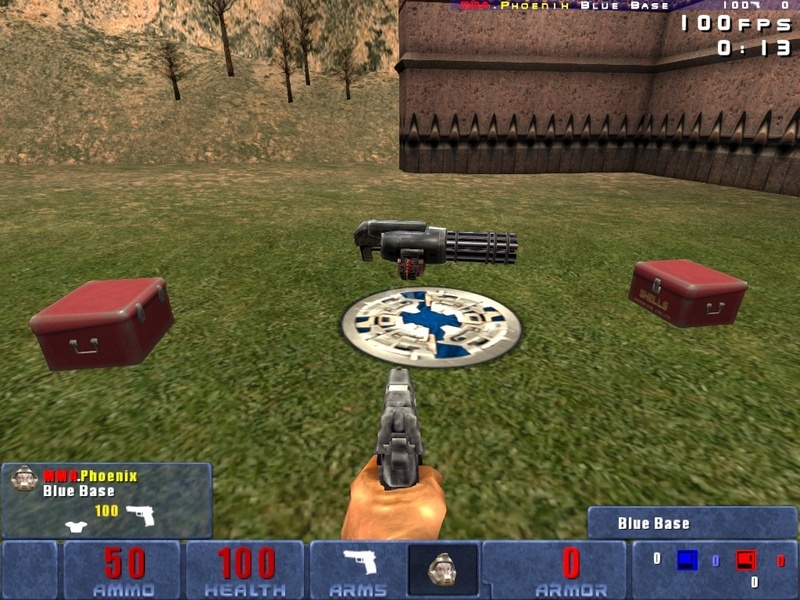 Heavy Chaingun: Note that the classic Doom Chaingun was referred to as Heavy Chaingun in .99f and prior. That weapon is now just referred to as "Chaingun" since that was the classic name, and while not fired in the first video, you can see the item is in place on the Railgun spawn. The Heavy Chaingun is Doom's answer to the Team Arena Chaingun, and fires 3 pellets per shot, putting it on part damage-wise with the Team Arena weapon. It also has that nice beefy shotgun sound to it. Ion Gun: It's basically a long-range ion shotgun. It fires 3 unstable plasma balls that inflict moderate damage at close range. After about half a second of flight, they explode into ion spikes that travel much faster and overall inflict much greater damage than they do in ball form. This is Doom's answer to the Team Arena nailgun. Tesla Mine: Not shown in the video, but present in the image gallery, these are hand-thrown dynamos that adhere to any surface and lash out with a steady stream of electrical energy at any unfortunate foe that wanders too close to them. They'll attack and keep attacking until whatever they're zapping moves out of range or is reduced to a pile of steaming gibs, or the mine itself is destroyed. An individual Tesla Mine isn't much of a threat. Several clustered together are absolutely lethal. Mines can be shot and blown up, and will explode after a short time as with other proximity-based weapons. They do not deal much explosive damage, but you can attach them to other players and like another electricity-based weapon in Generations, they don't mix well with water. In addition to the Doom Warriors, the other three original Generations will be receiving new weapons for use in Team Arena. What those will be I won't say right now, but they're in the works and some of them may be very familiar once you see them. All game play modes for Team Arena will be supported - Capture the Flag, 1 Flag, Harvester, and Overload all work. The Kamikaze and Invulnerability powerups function as expected, and the ability to enable either Persistent Powerups or Persistent CTF techs adds even more depth and chaos to the game play. Take a peek and let us know what you think! Wow, that looks awesome! I've watched both of videos and I really love the work you've done with the Ion Gun and the whole Doom Generation! The ChainShotGun is also awesome, but I think that it will be a good idea to make its texture much darker or just paint the Heavy ChainGun black to make it look more different than standart Doom ChainGun. So, I like everything here and hope that you will make some incredible replacements for ChainGun, NailGun and Prox Launcher for Slipgaters! P.P.S Can't wait for release! Oooh look -- a signature! Finally a tangible evidence about the progress of this project, after so many years. I can't wait to the release, and who knows, maybe Generations Arena will be in an official competition in the upcoming QuakeCons in the future. I can only congratulate you for this great work. Thanks for all the dedication. Keep in mind that outdoors area in the screenshot is full daylight. Now that you say it -- DUH! Not a problem at all! Drop a link here if you like. Can't wait to download this version when it comes out. Interesting developments, and certainly enough to justify the long wait in which multiple developments have already happened in our lives! Revisiting this seems... surreal. They all have inspiration somewhere. Doom's Heavy Chaingun was inspired by the Chaingun zombies, Spider Mastermind, and my own gatling shotgun modification to Doom. The Tesla Mines are inspired from Quake 2's Ground Zero mission pack. As for the ion gun... I'm not aware of a Doom expansion with that kind of weapon, but then, I've not played much outside the cannonical Doom games (Ultimate, Doom 2, Final Doom). I actually drew some inspiration for that from the Assault Disruptor in Klingon Honor Guard. When are we getting a Bat'leth?! I have to say that this is a huge surprise, and great to see. I remember TA support being mentioned many moons ago, but it looks as though you guys are going all-out for it. A little bit of artistic licence never hurt anyone, and these weapons are by no means out of place. Can't wait to see what's in store for the other classes. Yes. Slippy will get to go "pew! pew! pew! ".